A Day in the Life of the Bowers': Did I say Pneumonia... ? OK... I'm an engineer... sorry, that's just me... so, when I am told 'the Xrays are 100% better than yesterday's and there is no pneumonia' 100% means to me - done - fixed - completely reversed - finito! Ok, for medical folks, that just means it's much better... sorry for my misinterpretation. I got it, no need to explain, if you were only 10% of 100% total and you were 100% better, then you are only 20%... give be absolute positioning any day... relative will ALWAYS get you lost in reasoning... try to have a pizza delivered by giving them a relative house address... or have your mail delivered... sorry for the tangent... that's me.. Tangent Man! The doc this morning says that our daughter walks and talks like a duck and therefore has pneumonia... not really sure what the aquatic reference is all about, but hey, I'm easy... ducks ARE cute! Doc says Xrays are 100% better than yesterday... ok... with this theory, 1 x 1/2 x 1/2 never reaches 0, so my mind is spinning, when do we reach the goal... huh?!? The doc also says Hannah has 'pink jaundice' and may need light therapy if it doesn't clear up. This is Mike while Kim is breast feeding Hannah! 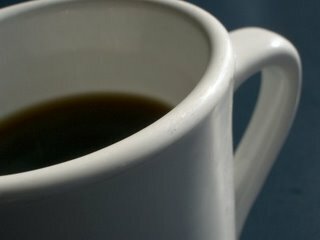 Notice his technique and the way he is latched on to the lid of that coffee cup! We call this position the coffee cradle. It is similar to the cross cradle or football hold. 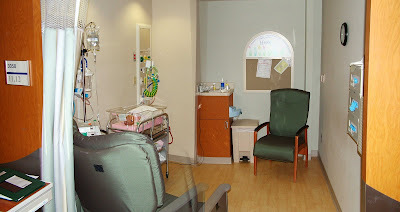 Here is a picture of Hannah's digs while in NICU. She will be checking out today to check into her new suite! "I'm not gonna look in there, cause I, I say, I just might be in there...! " She is precious. I am so happy for the both of you. I think she already has daddy wrapped around her little finger. I did a post on my blog dedicated to you Kim. You should read it, it's pretty funny. Hope you guys are getting some sleep! Nice you both have a sense of humor during this time. :) Great pics, too! I love this post and the pictures! I felt the exact same way when I started breastfeeding and after a week of soreness, I was SOOOO discouraged and just knew I was doing something wrong - but I wasn't. Soreness is absolutely normal. After the soreness went away it was GREAT! I love breastfeeding and can't imagine doing anything else!